There are always discussions about how to use Story points to compare or measure performance. Is it better than effort based performance evaluation or not? Can it replace effort based performance management or not? In a recent blog I demonstrated the practice of using Story points for comparing and measuring performance. Simply put, using Story points is an alternative method or, just another applicable method of measuring performance. I collected the most important rules you have to follow when you would like to use Story points to improve performance. 1. Forget baseline. When using a story pointing system, you don’t have a baseline or industry average (standard) that you can use for comparison. The baseline will be always the previous month or previous quarter that you can use for comparing the next month or quarter. 2. 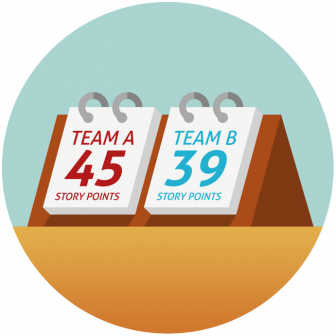 Set the rules of how to apply Story points to each tasks. You have to determine and publish a how-to-use guide for the use of Story Points for the team, – defined by task complexity. You have to also determine how complexity and effort spent on task correlates. How many points are applicable to each task. Usually Story points are between 1-10 where 1 is the easiest and 10 is the most complex. Creating exact definition and ranges in between 1-10 is necessary for effective measurement. 3. Evaluate monthly and compare quarterly progress. It is recommended to collect data of finished tasks and completed story point on a monthly basis and use a comparison on a quarterly basis. 5. Combine indicators with working hours. Add to indicators the total number of worked hours monthly and quarterly, and you can see how your team members are performing taken into account how many hours they reported to work. 6. Analyze tasks and create a task matrix. I strongly recommend to create a task matrix for each team member and analyze those tasks regarding their complexity. You can much easily evaluate the indicators above when you know exactly what kind of tasks are usually executed by your team members. How to come to a conclusion? The team performance has to show progress in the number of managed tasks and story points achieved (not unlimited). The average task per story point shows how complex tasks are managed by your team members, and using the tasks analysis you can confirm that this is true or false. You can compare performance by comparing the story point per worked hours monthly and quarterly. If the performance is balanced your team is working well. Reka is an economist with an MBA and 10+ years of experience in ICT with ERP, SCM, web, and mobile applications, as well as skills in international business development, consulting, and project management. You will find her blog posts on a variety of subjects from application lifecycle management and software quality standards to Agile methods. Can DevOps and ITIL Work Together? Does Waterfall Scale or Not? Are you Having Trouble Deciding which Agile Framework to Adopt? How Do You Know You Are Doing Scrum Right?